Egypt's President Abdel-Fattah El-Sisi received the US Director of National Intelligence Dan Coats and the US Chargé d’Affaires in Egypt Thomas H. Goldberger in Cairo on Tuesday, who praised the level of cooperation between Egypt and the United States at all levels, especially on counter-terrorism and intelligence cooperation, presidential spokesman Bassam Rady said in a statement on Tuesday. The meeting was attended by the head of Egypt’s General Intelligence Agency Abbas Kamel. El-Sisi conveyed greetings to President Donald Trump, stressing the significance of the strong Egyptian-American relations and the importance given by Egypt to enhanced cooperation with the US, especially on security and intelligence cooperation and coordination on regional and international security files. 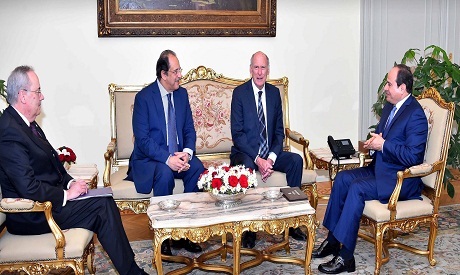 Coats stressed his country's keenness on enhancing cooperation with Egypt on challenges facing both countries, in light of the situation in the Middle East, hailing the Egyptian pivotal role in maintaining security and stability in the Middle East. The meeting discussed ways of pushing security and intelligence cooperation between both countries and exchanging views on Middle East files and political settlements for crises in the region.